Kanchenjunga (8,585 m.) is the 3rd highest mountain in the world which situated at north- east corner of Nepal between Nepal and India (Sikkim). It has five great treasuries of Snow. The Journey to Kanchenjunga base camp (5,143 m.) starts from sightseeing in UNESCO World Heritage sites in Kathmandu. After that, we take a short flight to Biratnagar or Bhadrapur from where we can drive to Taplejung or take a flight to Suktar (2,420 m.) and follow the Tamor River. Then we walk along the Ghunsa khola (River). On the way we walk through the dense lush forest that provides chances to see many wild animal Including Red Panda, one of the protected animals in Nepal, and Himalayan Black Beer. This area is popular for Snow Leopard, Blue Sheep, Musk Dear etc. Upper valley of this trek includes Gyabla (2,730 m.), Phale (3,140 m.), Ghunsa (3,595 m.), Kambachen (4,100 m.), Lhonak (4,785 m.) and Kanchenjunga Base Camp (5,143 m.). On the way we can see plenty of beautiful mountain glaciers, landscape and river valley of Nepal. On the way back from base camp to Ghunsa, we pass through Sele La (4,290 m.) and Margin La (4,480 m.) to Cheram (3,870 m). This geography is predominated by Rai, Limbu and Sherpa people practicing their own culture and life style. Day 21: Trek to Lalikharka2266m. 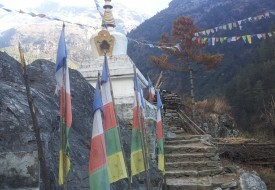 Day 22: Trek to Suketar 2420m. Additional activities (Safari-Bungee-Paragliding-Rafting and so on.